Sash's interest in creating street art stems from the idea that art is for all people to enjoy and it should serve to stimulate thought and dialog in the individual. As a means to engage a broader and curious-inclined audience through her street art, Sash has developed and implemented the use of geohashtags in conjunction with social media to interact with her audience. AINAC is based out of Brooklyn, NY. He made his first appearance in NY in late 2012. Ever since then, AINAC has been marking his territory with his tag of a presidential head of Abraham Lincoln. For several months, AINAC's tag of Abraham Lincoln as well as other significant and controversial pieces of artwork have been displayed throughout the boroughs of NYC. With constant improvement and continuous progression in his artwork, AINAC's work has evolved and developed into a unique and original style. The very latest series of work that he has been putting his time and effort into is titled the “Construction Series” which stems from the craftsmanship being implemented. This series includes hand-built, hand-sanded shadow box frames, with 3 dimensional scenery and images. This series of work also consists of various backgrounds including leather and wood to set the bar high for other artists. Various new pieces are shown on AINAC's website in effort to promote a new form of hands-on artwork. The Dotmaster, a UK artist, started painting on the streets of Brighton in the early ’90s. He takes a sideways look at a populist media with a typically English sense of humour. His work is impeccably detailed – his half-tone work, stark black and white street pieces and unique, photo-real colour stencils all create street-based illusions that fool the eye. STRØK / anders gjennestad – IS A NORWEGIAN STENCIL ARTIST WHO EXHIBITS IN GALLERIES; ON STREET WALLS HE GOES BY THE ALIAS STRØK. HIS HAND CUT MULTI LAYERED STENCILS CREATE PHOTOREALISTIC IMAGERY, WITH DEPTH AND DETAIL THAT IS COMPLEX, TACTILE AND MENTALLY ENGAGING. THE PLACEMENT AND CHOICE OF MATERIAL PAINTED ON, RUSTY METAL, GRITTY WALLS, SHINY GLASS, DEPICTS THE NATURE OF THE SUBJECT AND ENABLES THE WORK TO INTERACT WITH THE SPACE. Experimentation using stencils and spray paint started around 1992 or 1993; today, almost all of my posters use this medium. The drawbacks to this are limited runs (above 40 prints and the stencils need recutting), a time consuming process( hampered by moist or cold weather), and a destruction of brain cells (hopefully slowed by a mask). Everything is done by hand, from designing and drawing it to cutting it out (I am lost on a computer) – making it a lengthy labor. We make rainworks to give people a reason to look forward to rainy days! It’s going to rain anyway. Why not do something fun with it? Subay started drawing in 2001. His second campaign was ” The Walls Remembers Their Faces”. This campaign was launched as a reminder of the forcibly disappeared politicians and people. It lasted for about 7 months and its activity reached the provinces Sana’a, Ibb, Taiz and Hudidah. The Third and most recent campaign was “12 Hours”. Its main aim was to discuss 12 major issues in the Yemeni society. It lasted for a whole year. 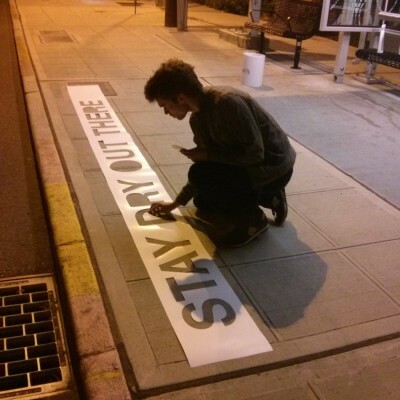 Xander Weaver-Scull is a social/environmental/climate justice awareness artist. The majority of his recent work portrays threatened, endangered and recovered species. He has explored alternative means of applying his stencils without using spray-paint. A Vancouver Street artist with nothing better to do with his time. Dede is a Tel-Aviv-based conceptual artist who utilizes various mediums to communicate within the public arena. He has been displaying his art on the streets of Tel-Aviv and other cities worldwide since 2006. A self-proclaimed ‘urban tourist’, Dede strolls through the dynamic urban environment, complementing it with creations that focus on the absurdity of the urban existence. Dede’s creations aim to promote reexamination of personal and societal conventions. His art revolves around issues of identity, belonging, loneliness, alienation, and the consequent desire to escape reality, either physically or spiritually.